"We would like to reassure the Zimbabwean Ministry of Sports, Zimbabwe Rugby Union, and all partners and fans that the situation was addressed immediately, and an acceptable solution has been found this morning. Tunisia Rugby Union took the Sables management to visit another hotel which was accepted," the statement read. "Rugby Africa and Tunisia Rugby Union would like to express their sincere apologies to the Sables team and management for this unfortunate situation. This does not reflect the standards of the Rugby Africa Gold Cup competition and we sincerely regret any prejudice caused." However on Wednesday, the Tunisia Rugby Union distanced themselves from the shambles and released a statement with their side of the story. "It is important to note that the delegation of Zimbabwe started complaining as soon as they arrived on July 2 at the Tunis Carthage airport. Indeed, the head of the delegation refused to pay the entry visa fees on Tunisian territories (60 dinars per person) explaining that he did not have the amount requested knowing that the Tunisian union had previously informed Rugby Africa by mail on June 8, informing them on all these procedures that go beyond the prerogatives of the union. "Nevertheless, the head of the delegation persisted in not paying these fees, which caused a long delay for the members of the delegation and a four-hours delay. We had to contact the CEO of Rugby Africa who spoke on the phone with the head of the delegation of Zimbabwe who subsequently agreed to pay the invoice of the visa fees. It is important to note that these visa procedures are common between African countries," said part of the statement. 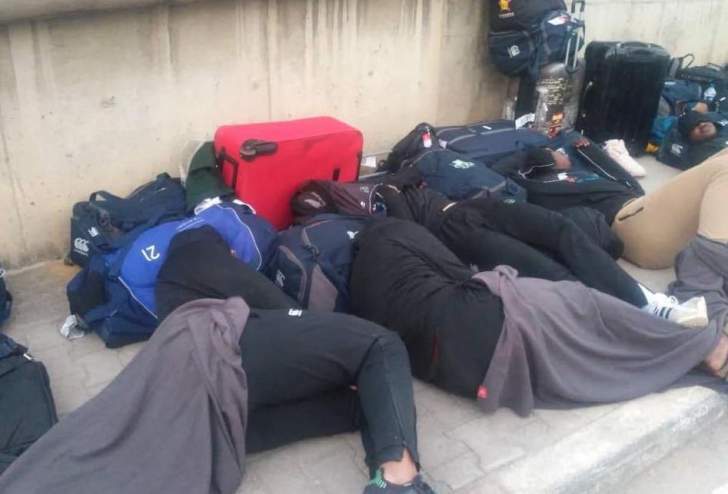 The Tunisian Rugby Union also alleged that Zimbabwe took it upon themselves to leave the hotel the Union had booked them into - citing slow internet speed and the state of one bathrooms and the fact that there was no swimming pool in the hotel. "They arrived at the hotel around 20:00, checked in at reception and all the members of the delegation of Zimbabwe were entitled to a dinner, until then no problem was reported," it continued. "Around 23:00, the head of the Zimbabwean delegation expressed reservations about the state of the bathroom in one of the rooms, the lack of a swimming pool and the low internet speed. So, he started talking about leaving the hotel on the pretext that it is not decent enough for his team. "The quick intervention of the president and three members of the organizational committee was not enough to calm him down and convince him to spend the rest of the night at the hotel, ensuring that they would find solutions in the next morning with the possibility to change the hotel. "Instead, he asked all the members of the delegation to take out their luggage, leave the hotel and spend the night outside on the ground. Unfortunately, local officials have tried to talk and negotiate with the head of delegation but remained unsuccessful," said the press release. "The Tunisian Rugby Union expresses its deep regret for this unfortunate event and strongly deplores the anti-sports and unethical actions of the Zimbabwean delegation which do not reflect the strong ties of friendship between the two countries. "It confirms through this press release that Tunisia is, and will always be, a country of hospitality, always proven and that will make its pride," concluded the statement.